Long before the steeplechase events started on the track at 7:30 PM, it was a great day for Colorado. Anna Hall saw to that. But a great day got better, and most particularly in the boys 2000 steeplechase. After biding their time for four laps, Zac Witman and Sadio Fenner found themselves all alone in front on the final of five laps. They would finish within a second of each other, but it was Zac Witman who held off Sadio Fenner at the end. Witman ran 6:17.26 to 6:17.68 for Fenner. That would mean Fenner would not repeat at the Great Southwest champion, but Colorado did still end up with a second consecutive title in the event. 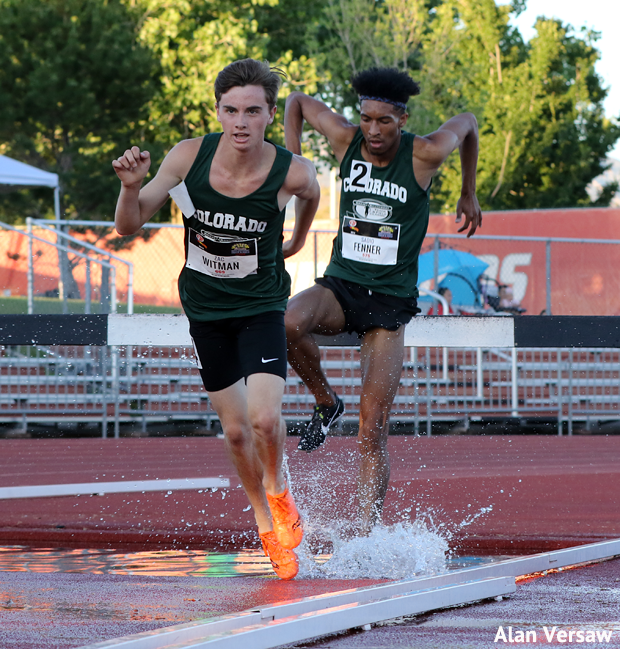 Other highlights of Friday evening action for Colorado included a third-place finish in the girls 2000 steeple for Layla Roebke and a second-place for the Colorado girls A team 4x100 meter shuttle hurdle relay. Results and photos to be posted soon!